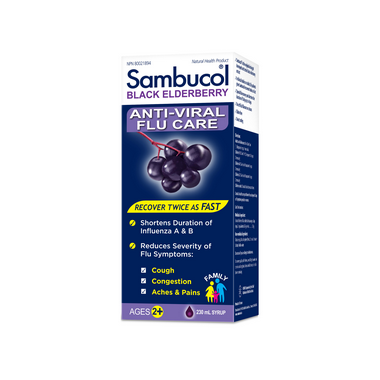 The unique black elderberry extract found only in clinically proven Sambucol provides a concentrated source of flavonoids – powerful antioxidants that not only boosts the immune system but fights viruses preventing them from spreading. Dosage: Adults and Adolescents 14+: Take 15 ml (1 tablespoon) of syrup 4 times daily. Children 9-13: Take 10 ml (2 teaspoons) of syrup 3 times daily. Children 4-8: Take 5 ml (1 teaspoon) of syrup 3 times daily. Children 2-3: Take 5 ml (1 teaspoon) of syrup 2 times daily. Children under 2: Consult a healthcare practitioner. Non-medicinal ingredients: Glucose syrup, Natural raspberry flavor, Citric acid, Potassium Sorbate, Purified water. Great product! Helps to fight cold and virus symptoms. Most efficient when taking as do is as first symptoms show up.